My son just joined a contest sponsored by Sustagen and the Philippine Star. The contest is entitled "A Toast to THE MAN and the Best Advice He Has Shared With You." I was touched at what John Dwight wrote in the contest and never though that the advice would have such an impact on him. I remember when we finally had the chance to be together after his mother and I separated in 2003, he was very happy. I was then saddened to see how his studies went during that time. His grades were very low and well disappointing. From there on I do all that I can to teach him and let him know that education is really relevant. "I only had a chance to be with my Dad when I reached 10 years old, I was Grade 4. I was not good in school and hate studying. My Dad enrolled me in a private school and helps me in studying my lessons. Oftentimes, I get irritated because he was so persistent in teaching me. Then I understand that in life nothing is impossible as long as you believe in yourself and as long as you believe you can do it. From there on I began achieving things which before I thought I can’t do. Thanks Dad for making me better!." Hope he wins. 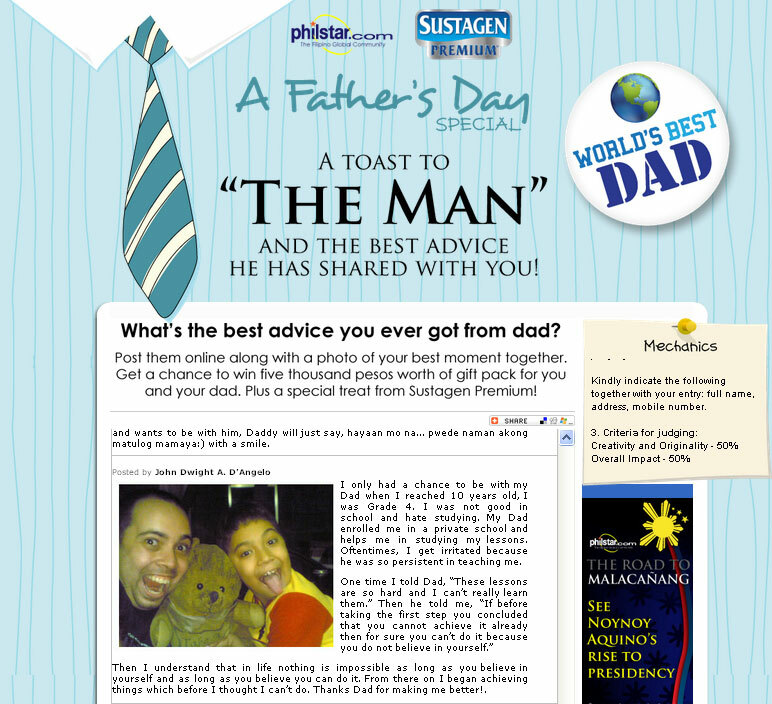 Thanks to Sustagen and the Philippine Star for coming up with a contest like this. For the submitted entries you can view it HERE.